Demos were recorded for Alarma!. Among them were "Little Things", "As Long As I Live" (also recorded earlier in fall 1978) and "Off My Mind" (all three, with Ojo Taylor on keyboards. "Little Things" and "Off My Mind" were later released on "Shirley Goodness and Misery". 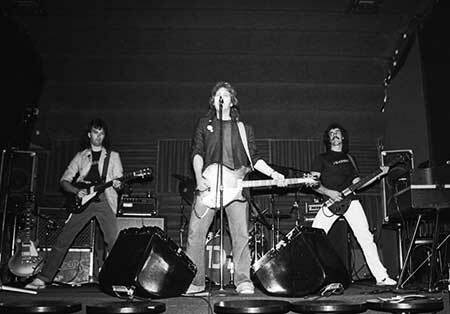 The 1981 demo for "As Long As I Live" was later released on the Terry Scott Taylor CD single, "Mr Flutter"), "My Room", "No Spaceship", and "Out of Town" (all three included on the CD reissue for Alarma), "Faces To The Window", "Only One", "Hit Them", "Walls of Doubt", "Through The Speakers", "Colored By", "Central Theme". Terry: "That was complicated too, because we were in a contract with Larry (Norman). Basically, our hands were tied. Here's this creative band chomping at the bit, ready to keep going, to make records and tour, to keep writing songs, and Horrendous Disc was just holding it all up. It was so frustrating it could bring tears to your eyes... we were struggling financially, it was a very, very tough time. And most record companies didn't want to deal with us, because we still had the cloud over us of these contracts with Norman, and still an unreleased album." The following songs were performed in concert during this time: "Everyone's fallen down" (Taylor) and "Love has open arms" (Taylor). Petra's Never Say Die is released. Alex MacDougall played percussion on the album. 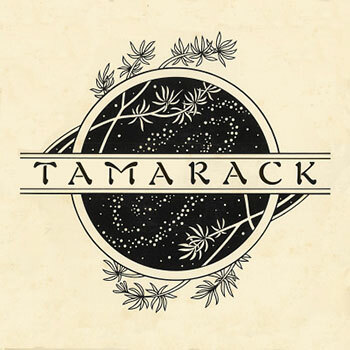 Tamarack's self-titled album is released. The band includes future DA keyboardist Rob Watson. Larry Norman's Barking at the Ants is released on Larry's Phydeaux label. 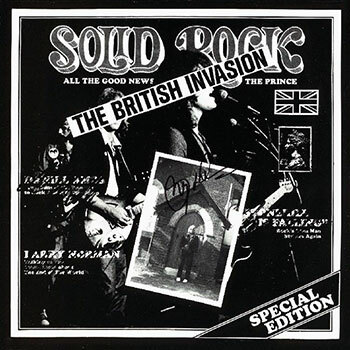 The cover of the record featured a large photo of Terry Taylor and Randy Stonehill in concert, with a white strip across their faces that read "The British Invasion." Additionally, there were four sharp, black fingernails drawn on Terry's hand. Since the record was released, the image has created a lot of confusion among fans of both artists and even among the folks at Solid Rock. There doesn't seem to be a clear picture of how the drawing got there or why it was there in the first place. In 2000, Norman told us that he never noticed it before and had to get a magnifying glass to see it. He later said that he thought that one of his relatives had done the drawing. He also said that it was a stupid, childish thing and apologized for allowing it to get released that way. 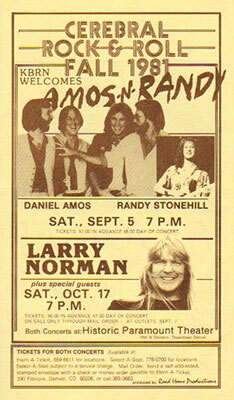 In 2003, the following text was included on the LarryNorman.com website about the image. 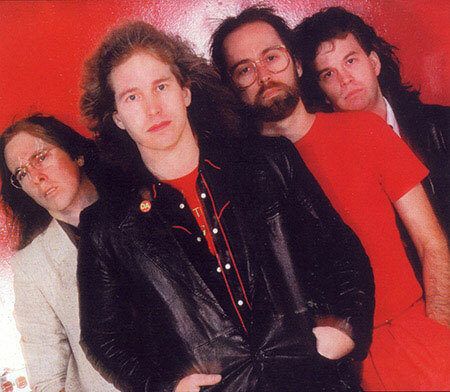 "One of the musicians who was a fan of Daniel Amos gave Terry Taylor black nail polish to "Anglify" the underground reputation the band had. Less than a year later it was being rumored that the black nail polish was actually sharp, pointed claws to demonize him. File this under "Can't Get A Break" because when Larry returned to America there was a conspiracy theory to rival the "Paul Is Dead" paranoid fantasies." DA eventually signs with Benson Music's NewPax label after they were released from their contract with Larry Norman and Solid Rock (contrary to some reports, DA did not break their contract with Solid Rock. Their contracts were legally and validly rescinded because of their nature). Terry: "...the Benson Company took a chance. They said we'll just do it in good faith, and let the chips fall where they may. We appreciated the people there for that. So we went in and did the record, and the two albums came out within two weeks of each other, something like that." At one point during the Alarma Sessions, studio engineer Derri Daugherty accidentally bulk erases everything except the bass guitar track on a song being produced for the album. Daniel Amos is featured in CCM Magazine, in two different articles. "Whatever Happened To Horrendous Disc?" Daniel Amos performs at San Gabriel High School in San Gabriel, CA. Daniel Amos performs at a High School in CA. Daniel Amos performs in Pasadena, CA. with Randy Stonehill. Daniel Amos performs in Everett, WA. Daniel Amos performs in Vancouver, B.C. Canada. 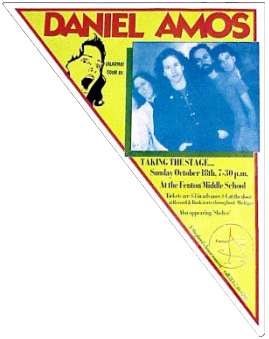 With the Orpheum Theatre closed by a strike, Anvil Productions chose St. Andrew's Wesley Church as the shows venue. Daniel Amos performs in Kelowna, B.C. Canada. 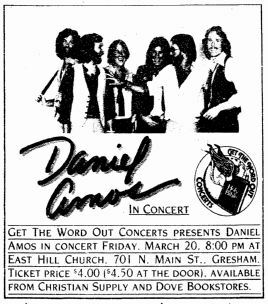 Daniel Amos performs at the Cowles Auditorium at Whitworth College in Spokane, WA. Final masters are created from the 8-track masters by Word Records for Horrendous Disc. Daniel Amos performs in Longview, WA. The previously ran Solid Rock advertisemtent for Horrendous Disc reappears in CCM magazine, this time with the caption: "After 744 Days Captive.... It was released April 1st. Vanishing now at your corner bible store!" JWS reviews Horrendous Disc and Alarma! for CCM Magazine. View Album Reviews for Alarma! Daniel Amos performs in Kalamath, OR. Daniel Amos performs at Disneyland as part of the Nite of Joy. 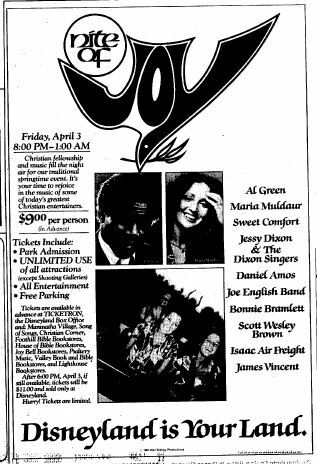 Other performers include Al Green, Sweet Comfort Band, Jesse Dixon, Joe English and others. Horrendous Disc is finally released, three years after it was recorded. Terry: "We did 'I Love You #19', which apparently inspired three or four of the Christian heavy metal bands you hear today. Jimmy Brown and Deliverance thought that was their spiritual anthem when they heard it. Sort of heavy guitar... it was recorded much too slowly. We picked up the tempo as a band when we did it in live performance. Jerry: "We gave ILY the #19 designation because Terry and I took a trip down to our local record shop and perused the yellow-paged directory of recorded music that used to perch atop the counters of major record stores in America. I remember counting the number of songs listed with the title, "I Love You". There were 18 listed at that time..."
Alex: "A tremendous creative experience for me during the recording process. I remember a feeling of exhuberance planning percussion overdubs/sfx for the title track. It was a labor of love. I remember we all recorded the basic tracks in our pajamas. Terry's brilliance was shinning through. Mark was great with arranging and Jerry was such a good vocal "thinker". Ed was just right, and Marty was great on bass. It was a team effort." The green and red flying disc seen on the album cover is in fact a various artists LP from 1978 entitled Push For Excellence, released on Myrrh Records (MSB-6617). Side One was painted, the label on Side Two lists the following tracks: 1. "All Of Me" - Danniebelle, 2. "Your Love" - Bili Thedford and Danniebelle, 3. "Christ Has Made The Difference" - Jessy Dixon, 4. Rev. Jesse Jackson, 5. "Soon And Very Soon" - Andre Crouch. 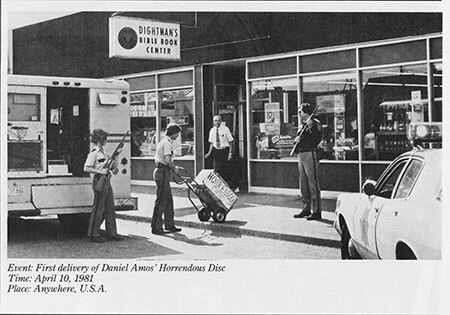 The photo below was taken at Dightmans Bible Book Center. Alex MacDougall's brother Beau releases a solo album, "This Side Of heaven" on Milk & Honey Records. Beau (Alex's brother) sang and played guitar, Tom Howard played keys, Marty played bass, Alex plays percussion, Jerry sang BGVs. The album was produced by Alex and Beau MacDougall The album was produced by the MacDougall brothers. Maranatha! Music releases Praise V: Time to Praise the Lord. Alex MacDougall played percussion on the album. Daniel Amos performs at the Bijou Theater in Knoxville, TN with Randy Stonehill. Daniel Amos performs at Calvary Chapel in Downey, CA. Daniel Amos performs at Young Life in Sacramento, CA. Daniel Amos performs at a Prison in Long Beach, CA. Daniel Amos performs in El Paso, TX. Daniel Amos performs in Albuquerque, NM. Daniel Amos performs in Glendora, CA. Ed McTaggart's fourth child, Jerusha is born. Daniel Amos combined personality and concept on the outside and inside of their Alarma! album, conceived by the group. Photographed by Scott Lockwood and designed by Karen Knecht. Terry: "I really like this record. I think there are a lot of good songs on it. It has it's own sound. A lot of people think it's very new wavish... I guess there was a certain degree of that element to it. The songs seem to hold up well over time, and I'm happy about that." Songs that didn't make the final cut include "Only One," "No Spaceship", and "Out Of Town." Daniel Amos performs in Fresno, CA. Daniel Amos performs in Oakland, CA with Randy Stonehill. Daniel Amos performs in Visallia, CA. Daniel Amos performs at a Prison in Downey, CA. Daniel Amos performs at a Prison in Alhambra, CA. Daniel Amos performs three sets at a Prison in Sylmar, CA. Chuck Girard recently played Vancouver's PNE Gardens. 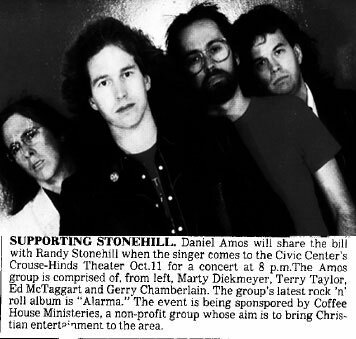 Band members were Larry Myers, Wayne Brazel, John Patitucci, David Spurr and Rob Watson - later a member of DA. 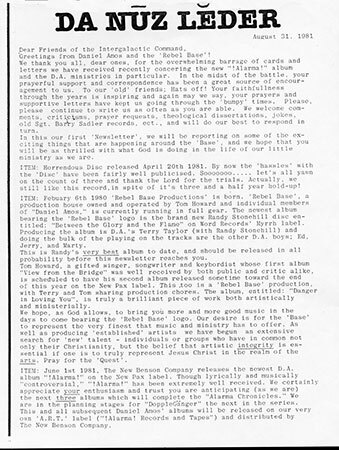 CCM magazine receives an angry letter from an upset reader about the April 1980 Solid Rock ad for Horrendous Disc. An article about Daniel Amos appears in CCM Magazine. The article is largely a review of the bands March 27th concert in Vancouver, BC Canada. Daniel Amos performs in Sacramento, CA. for Warehouse Ministries. Daniel Amos performs in Santa Rosa, CA. Daniel Amos performs in Anaheim, CA. Marty Dieckmeyer leaves DA to persue his Masters in Engineering in Southern California. Mark Heard's Stop the Dominoes is released on Home Sweet Home Records. Alex MacDougall played percussion on the album. Maranatha! Music's God Loves Country Music is released. The album features vocals by Terry Taylor on the track "The Christian Life." 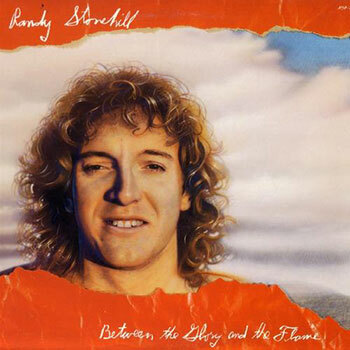 Randy Stonehill's Between The Glory And The Flame is released on Myrhh records and Rebel Base Productions. Terry Produced and plays the Electric Slide Guitar; Jerry sings Backing Vocals, plays Lead And Rhythm Guitar; Tom Howard sings Backing Vocals, plays Synthesizer String Arrangement, Piano, Harmonium, and Acoustic Guitar; Marty Dieckmeyer plays Bass Guitar; Ed McTaggart plays Drums & Percussion; Alex MacDougall plays Percussion. The first 'DA Nuz Leder' is mailed out. A positive letter regarding Horrendous Disc appears in CCM magazine's "Feedback" column. Full page ads for �Alarma! and the �Alarma! Radio Show also appear in the issue. The �Alarma! 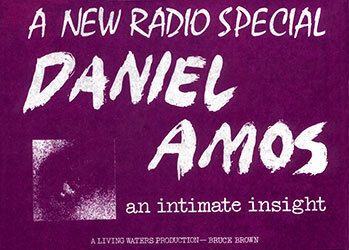 Radio Special airs across the country. The special was produced by Bruce Brown. Tim Chandler Joins Daniel Amos. Daniel Amos begins the �Alarma! Tour with a performance in Denver, Colorado. The road crew was headed up by Wes Leathers and Derald Daugherty. Randy Stonehill opened the show. Daniel Amos performs in Denver, CO. with Randy Stonehill. Daniel Amos performs in Boulder, Colorado at the Blue Note Club. Daniel Amos performs in North Platte, Nebraska. Daniel Amos performs in Naperville, Illinois. Daniel Amos performs at Notre Dame university in South Bend, Indiana with Phil Keaggy. Daniel Amos performs at Point Loma College in San Diego, California. Daniel Amos has two new albums on CCM Magazine's sales chart simultaneously. "Alarma!" is #7 and "Horrendous Disc" is #8. Daniel Amos performs in Medford, New Jersey. Daniel Amos performs in Bay Shore, New York. Daniel Amos performs in Middleton, Nova Scotia, Canada. 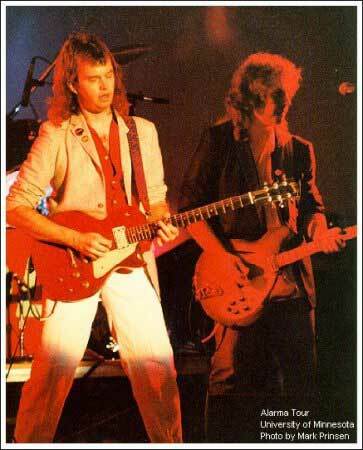 Tim: "One of the very first times I ever played with DA was in Nova Scotia in 1981. 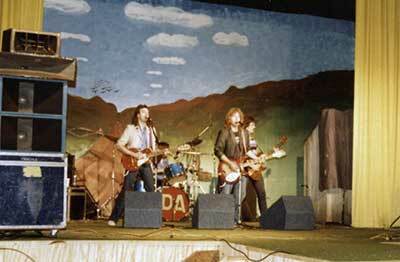 That was during a period of time in which some of DA's audience wasn't caught up on the fact that the band had moved on from country music. When we walked out on stage there was nothing but a Sea of Cowboy Hats in front of us. We played a loud blasting version of "Through the Speakers" for the first song. When we finished the song, there was no applause - and in fact there was nothing but total stunned dead silence. Crickets chirping and tumbleweeds blowing by. It was hilarious. All I could do to keep from bursting out laughing." Daniel Amos performs in Vancouver, BC at St. Andrew's Wesley Church. Daniel Amos performs in Truro, Nova Scotia, Canada with Randy Stonehill. Daniel Amos performs in Halifax, Nova Scotia, Canada with Randy Stonehill. Tom Howard's Danger In Loving You is released on NewPax records. 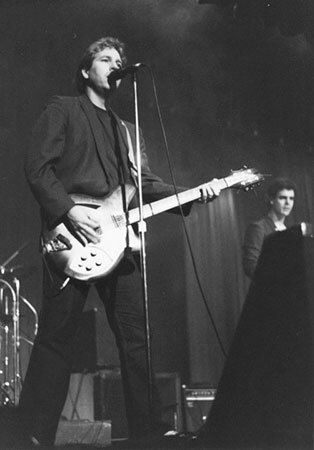 Terry coproduced the album with Tom for Rebel Base Productions. Terry Taylor, Jerry Chamberlain, Randy Stonehill and Bill Batstone sing background vocals. Daniel Amos performs in Presque, ME. 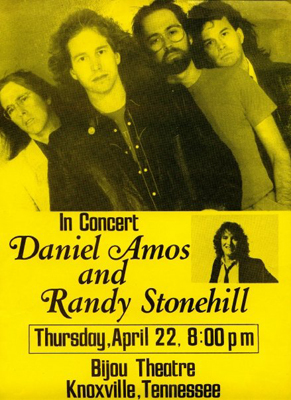 Daniel Amos performs at Barrington College in Providence, Rhode Island with Randy Stonehill. Daniel Amos performs in Washington, Pennsylvania. Daniel Amos performs in Grove City, Pennsylvania. Daniel Amos performs in Pittsburgh, Pennsylvania. Daniel Amos performs at Geneva College in Beaver Falls, Pennsylvania for their annual Homecoming Celebration. 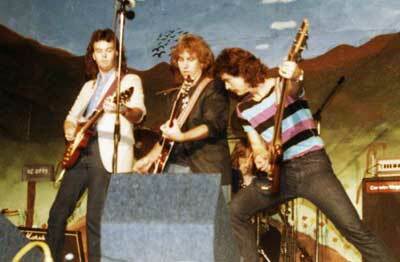 Andy Pratt also performs. Daniel Amos performs in Fenton, Michigan. DA guitar roadie Derri Daugherty met his future wife, Marlei, while on tour with DA in Michigan. Daniel Amos performs in Cleveland, Ohio. Daniel Amos performs in Columbus, Ohio. Daniel Amos performs at the Oasis in Springfield, Illinois. Daniel Amos performs in Milwaukee, WI. Daniel Amos performs in Roseville, MN. Daniel Amos performs in Souix Falls, South Dakota. Daniel Amos performs in Souix City, Iowa. Daniel Amos performs at the Englewood Theater in Independence, MO. with Randy Stonehill. Daniel Amos performs Calvary Chapel in Downey, CA. Once again, Daniel Amos has two new albums on CCM Magazine's sales chart simultaneously. Alarma! is #12 and Horrendous Disc is #14. 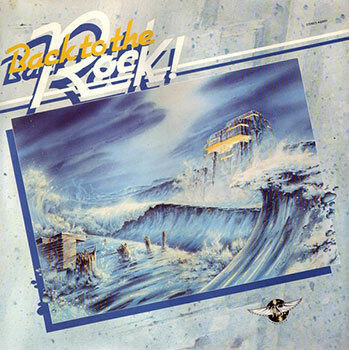 Word Records releases the Various Artists album Back to the Rock. Future DA keyboardist Rob Watson's band Tamarach performs "Good Times Bad Times" & "Here I Am". Rob also plays keyboards on John Mehler's "Can't Live Without Him", and wrote "Good Times Bad Times". Daniel Amos performs in Pheonix, Arizona. In CCM Magazine's "Year In Review" issue, "Horrendous Disc" is listed as one of the top 15 selling albums of the year. "I Love You #19" is listed as #19 on the CCM Magazine Top Airplay chart. Daniel Amos performs in Ventura, California.